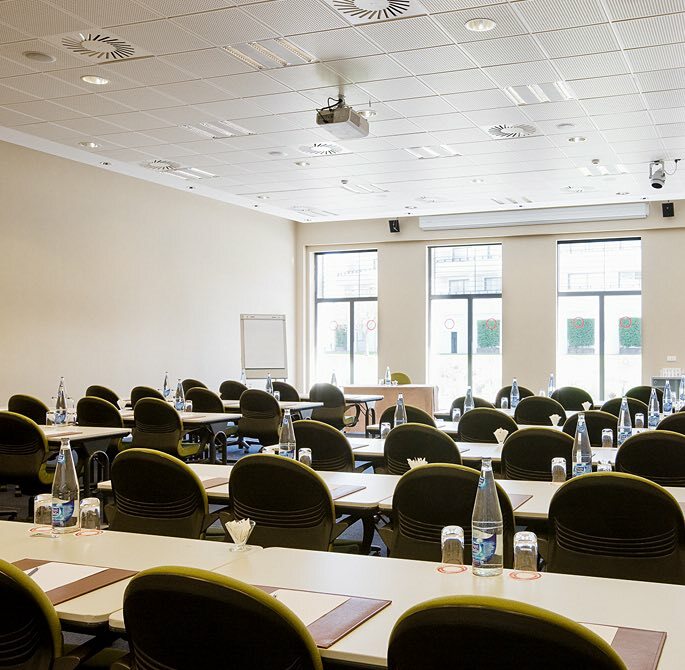 With over 2,175 square metres of event space and 40 meeting rooms, we can host meetings, conferences, and ceremonies of all sizes at Dolce Sitges. Our staff takes care of every small detail to ensure your event is a success. A clean and comfortable environment for your guests includes a permanent coffee-break service with no schedule restrictions and a wide assortment of drinks, healthy snacks, and meals. A climate offering 300 days of sunshine a year is the ideal atmosphere for all types of events. Choose from an array of indoor and outdoor venues with terraces sharing a panoramic view of the Mediterranean Sea. Get creative as Dolce Sitges provides unlimited possibilities to customize your event beyond compare. Balmins I - 26,43 m2: The right setting can be the difference in closing a successful deal or departing valuable information to your audience. Balmins II -26,43 m2: Measuring 26 square metres, Balmins II is great for intimate communication. Balmins III -22,87 m2: Host powerful meetings that connect and inspire your audience. Ribera I-24,57 m2: Get closer to your audience for the kind of intimate connection featured in every successful meeting. Ribera II-24,57 m2: Utilize this smaller meeting space where a speaker can maximize all of its amazing benefits. Fragata I-23,52 m2: Work together as a group on your presentation or project in our Fragata room. Fragata II -25,74 m2: This cozy and quiet space can accommodate up to 20 people, allowing groups to focus and achieve their main objective. Espanyol I -26,34 m2: Dolce Sitges offers rooms for meetings of all types with every resource you need to make influential connections. Espanyol II -24,54 m2: Present and hold discussions in our Estanyol room measuring 25 square metres, perfect for up to 20 people. Còdols I -25,49 m2: Make clear and concise presentations in a very flexible space perfect for up to 20 people. Còdols II 20,62 m2: Codols offer a relaxed and comfortable environment for both speaker and guests. Còdols III -45,98 m2: One key to a successful lecture is having a comfortable audience. Enjoy the comfort that allows guests to relax during lectures and events. Marina -19,68 m2: The Marina room provides a comfortable and relaxed setting, perfect for both lectures and private events. 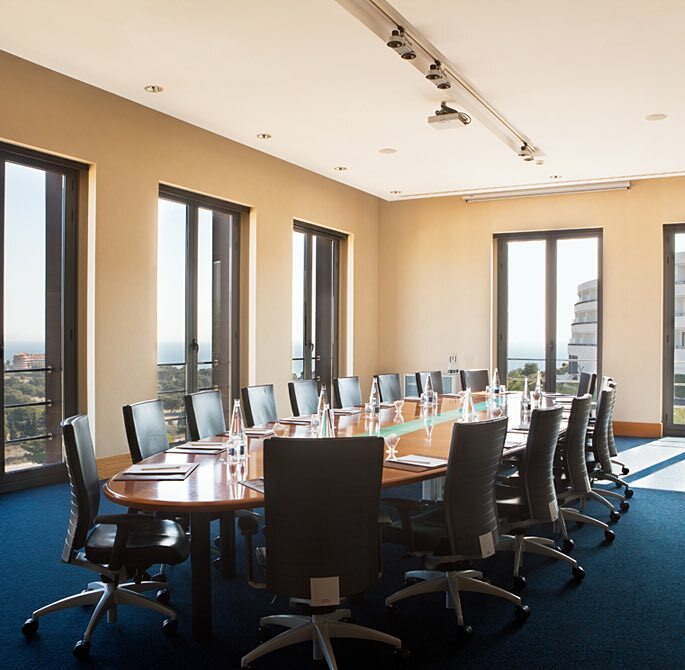 Balcó -10,95 m2: This room provides a relaxed environment ideal for Q&A styled meetings and events, person to person information and instructions sessions. Rooms 401-427 (Unequal) -21 m2: The possibilities are limitless at Dolce Sitges because we provide an expansive catalog of room types. Host business partners or private events in lovely spaces that provide creative flexibility. 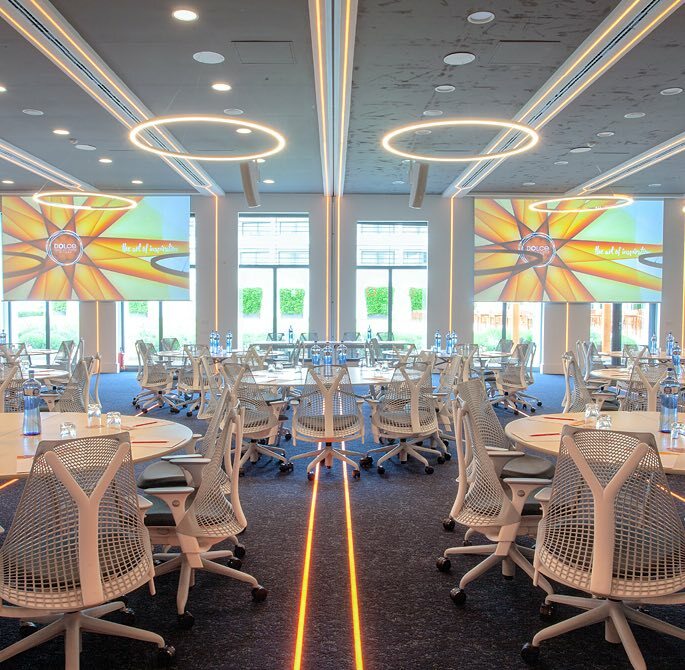 Sitges - 515,28 mxm: Having a successful conference in a spacious setting means connecting with your audience. The flexibility of our Sitges room is great for engaging lectures where the speaker and the audience can communicate. Mediterrani -449,50 mxm: A classroom setting where groups can learn from each other can be the perfect meeting type for your event. At Dolce Sitges, we've considered every meeting style; try our banquet or classroom style meeting spaces in this diverse room. Parellada - 149,34 mxm: The Paralleda room is filled with natural light that enhances the ambience and communication experience between speaker and audience. It is truly the perfect space to relax, teach, and learn together. Syrah -150,71 mxm: Imagine the ideal classroom setup with comfortable seating, spacious desks, and state-of-the-art audiovisual equipment. Samsó -149,34 mxm: From small groups to medium and groups of a larger size, Dolce Sitges has the conference room to accommodate you all. 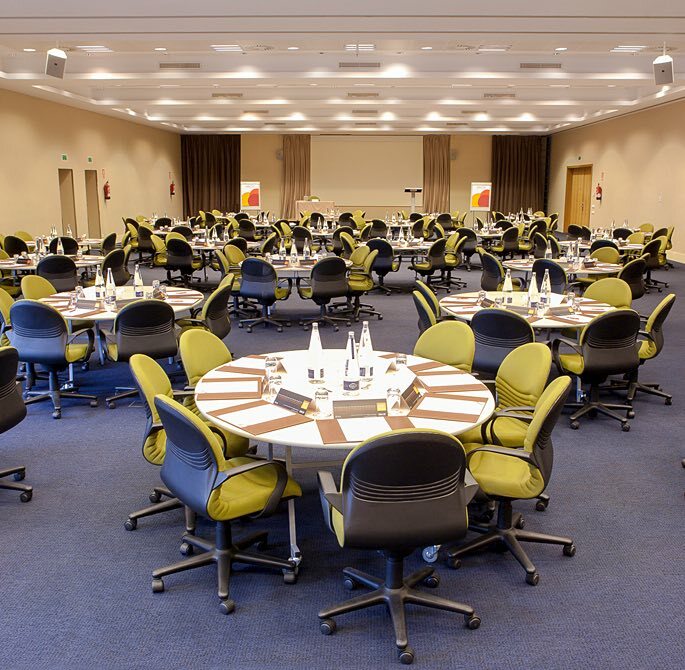 Garraf -135,00 mxm: Our Garraf meeting space measures 135 square metres with a total capacity of up to 108 guests. Moscatell -96,15 mxm: Our Moscatell room provides an intimate setting in a flexible space measuring 96 square metres. Macabeo -90,34 mxm: Share ideas using state-of-the-art audiovisual equipment set up by trained professionals. Monastrell -90,63 mxm: Our meeting professionals are here to help provide you with answers to make your meeting is a success. Garnacha -89,42 mxm: With state-of-the-art audiovisual equipment and a creative imagination, our staff can ensure your event is a success. Ginesta -136,16 mxm: An expansive catalog of rooms and room types allows you the flexibility of choosing the right setting for your meeting size and style. Miralpeix - 65,02 m2: Miraplex is a meeting space designed to impress. 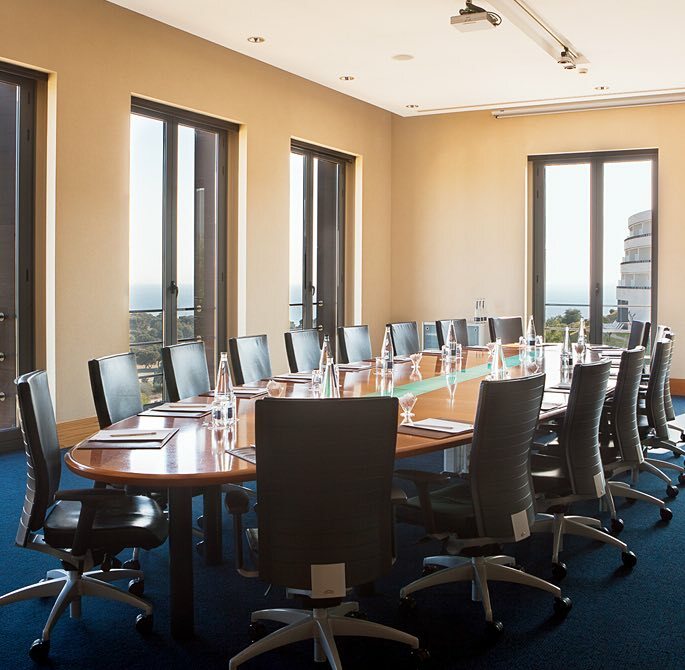 A sleek style boardroom furnished with comfortable seating and a great view. This boardroom is perfect for up to 20 people. Maricel - 74,68 m2: Invite your prospective business partner to a beautiful town on the Mediterranean coast. 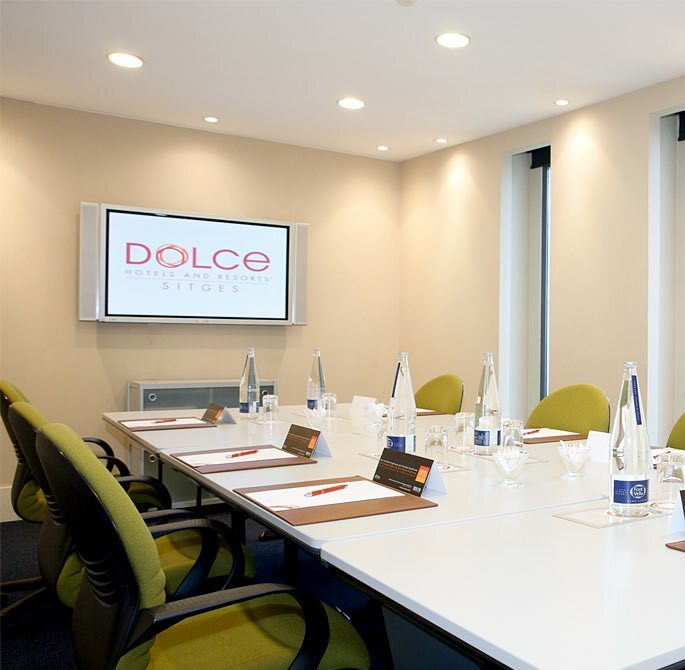 At Dolce Sitges, we provide a relaxed environment and equipment to match an intimate boardroom where your presentation and ideas will shine. 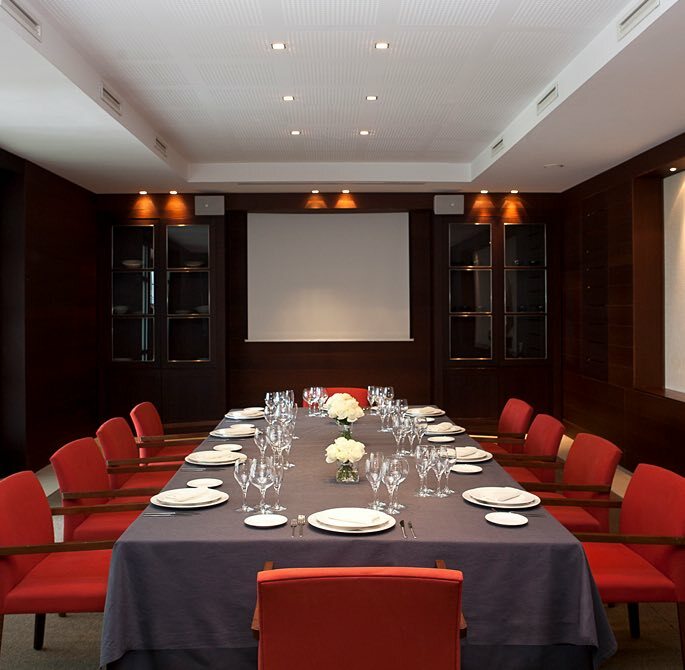 Racó de la Calma -51,44 m2: Host meetings and event that leaves a lasting impression in our private dining room, Raco de la Calma. Offering the space to accommodate a larger audience is one thing. Offering comfort and ease of access as well is another thing altogether. 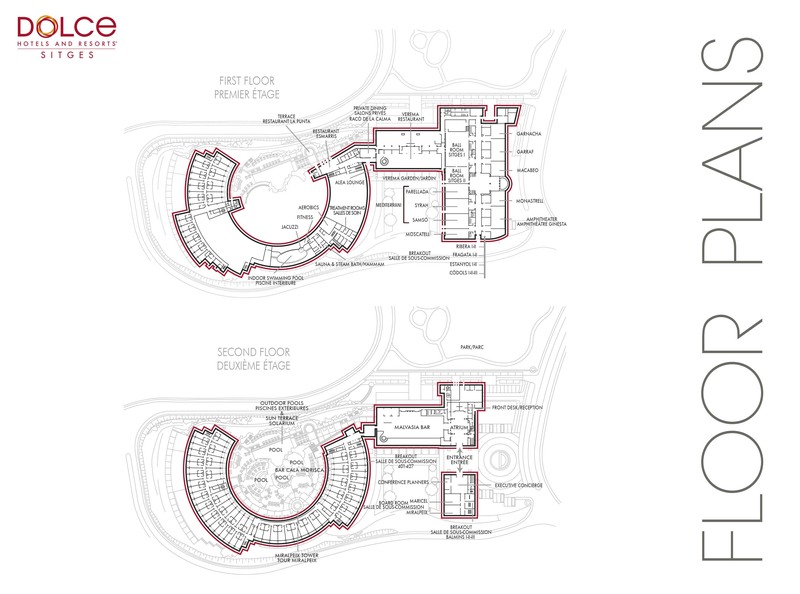 Consider our state-of-the-art theater-style seating venue with a capacity for up to 360 people. 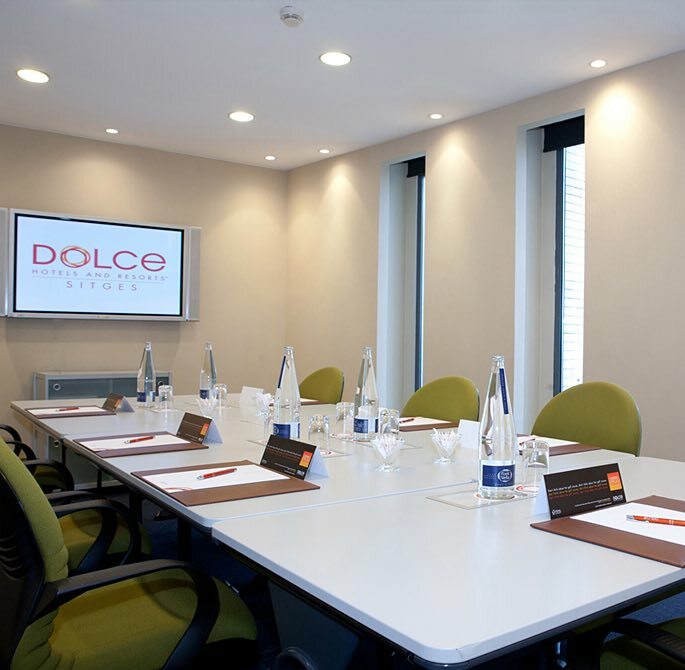 At Dolce Sitges, we've considered every meeting style; try our banquet or classroom style meeting spaces in this diverse room.